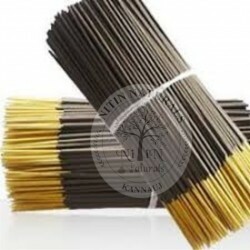 Our Agarbatti (Incense Sticks) are made of various natural ingredients. When its being burned it gives a pleasant aroma and spread positive energy. It reduce negativity through its fresh fragrances. Our Natural Hawan Samagri is a mixture of various dried herbs and spices which have its significant smell and effect. By using our sacred hawan samgri in pooja, the whole atmosphere is fulfilled with positive energy. 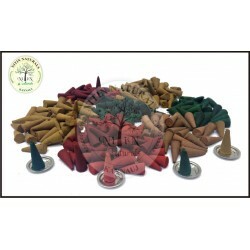 Our Natural Dhoop Cones are best for pooja because it have exotic and unique fragrances like, sandal, rose, mogra, lavender etc. It refreshes whole atmosphere through its heart touching fragrances. 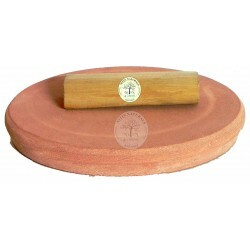 We have the best quality small sandalwood sticks used in pooja. We can used these sticks as Chandan Teeka. Our Natural Chameli oil is used for religious purpose. 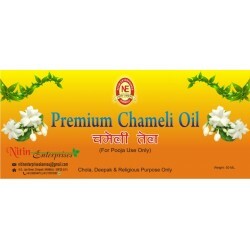 Chameli oil is used in prayer of Lord Hanuman and also in deepak, chola etc. Our Geela Dhoop is the best product used in pooja. It comes in three pleasant fragrances as Sandal, Rose, Mogra.